Over the past ten years jQuery has radically changed the face of frontend development. And beyond the basic jQuery library we also have a UI library and a mobile webapp library, both powered by the jQuery core. How do you even get started with all of this? Well for this post I’ve organized the absolute best books on jQuery and associated libraries ranging from the complete basics to more advanced materials. I’ve split this post into three sections based on the individual libraries(core, UI, and mobile). Feel free to pursue all the titles or skip down to whatever library you’re most interested in learning. Both the jQuery UI and Mobile libraries rely on the jQuery core so you’ll need to learn regular jQuery before moving onto anything else. If you’re not sure where to start I’d recommend jQuery in Action. 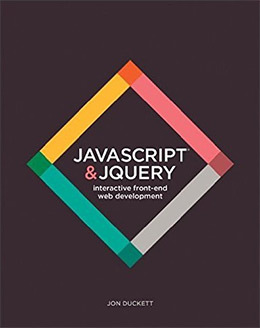 This book offers a step-by-step intro to jQuery and I love everything from the detailed exercises to the clear writing style totaling 500 pages long. These books cover jQuery from the raw fundamentals to the more advanced techniques. If you’re looking to learn and/or improve your jQ skills then you’ll find something in this list to help. The author of this book Jon Duckett is a renowned developer in the web design/dev space. He’s written many introductory books for the basics of web design and they’re all written beautifully for beginners. You can pick up this book from any level of experience and still work your way through the lessons. They start simple with the very basics of development including functions, objects, and loops. From there you’ll learn about the DOM and more advanced techniques like event handlers. This book is huge but it’s also very easy to read. If you’re a beginner without even basic JS knowledge this book can take you far. From there you’ll move into the jQuery core and even build interfaces with the jQuery UI library. 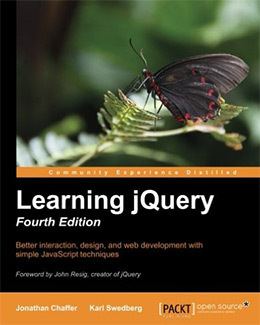 If you’re looking for an in-depth intro to jQuery this book probably won’t satisfy your needs. The content move fast and it jumps around to different topics based on the needs of common web dev problems. But this book is perfect for anyone who wants to jump into real projects with jQuery focusing on the important stuff. It just can’t give you an all-around view of jQuery like more comprehensive titles. 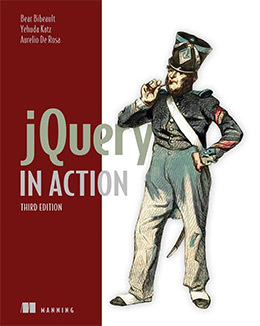 If you do want a comprehensive jQuery book then I have to recommend jQuery in Action. The newest edition comes with 500 pages full of exercises and best practices for jQuery development. The lessons teach through a step-by-step approach that covers the little intricacies of jQuery development. You’ll learn syntax through lessons covering how to manipulate the DOM, how to handle user inputs, build page animations, and validate form contents. Later in the book you’ll even learn how to properly structure a jQuery plugin from scratch. Many developers release their plugins for free as code samples and as resources for the community. By the end of this book you’ll know how these plugins work and you’ll even be able to create your own. I’d give this book my highest rating to anyone studying jQuery. There is just so much content here and by the end you’ll truly feel like a professional jQuery developer. I did a full review of this book if you want to read a little more. Development can be intimidating and sometimes a simpler book is better for newbies. Learning jQuery comes with a very simple writing style that’s easy to follow regardless of your technical background. The lessons cover all the important stuff and they’re pretty easy to follow. The authors also explain each bit of code to make sure you understand what you’re writing(or copying). However this is not a full comprehensive guide for beginners. This book targets devs who want a less confusing intro to jQuery rather than a full comprehensive guide. 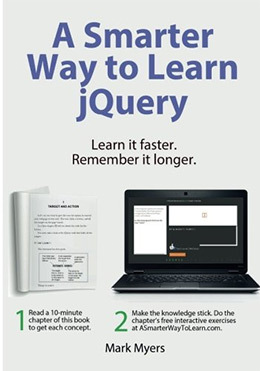 If you keep getting lost or confused in your practice then I’d recommend a copy of Learning jQuery. This book won’t bring you to a professional level but it will get you past the newbie phase. jQuery’s documentation is handy but can also be verbose & confusing. 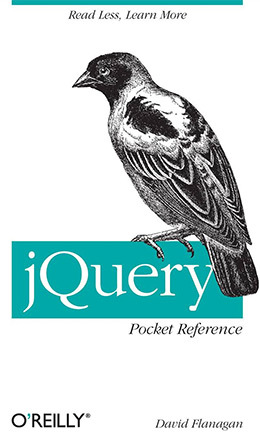 The jQuery Pocket Reference aims to solve this problem with common solutions, code snippets, and technical tips packed into this 160-page mini resource. The author David Flanagan has over 20 years of programming experience and he’s authored a few other dev books too. This pocket reference offers quick guides and snippets to help you scale common features with jQuery. Whether you’re building animated dropdown menus, form validation features, or Ajax scripts, this book has you covered. The index is easy to reference so you can literally jump to any chapter and grab whatever info you need. There’s also a small internal reference that condenses all the basics into a ~20 page tutorial guide. This book can be handy for beginners who need a quick reference but it’s not a complete guide to the language. I’d recommend using this as a lookup resource along with another guide like Learning jQuery. If you’ve struggled to actually apply jQuery code to your projects then I think this book will make a difference. A Smarter Way to Learn jQuery follows a rigid teaching style that includes theory, exercises, along with after-lesson tests to refresh your memory. Most of this info can be retained through repetition. But you can’t repeat something if you don’t even understand it. Thankfully the author Mark Myers has a gentle way of writing that appeals to anyone. The writing style is crystal clear and it can easily take you from a simple JS coder to a masterful jQuery magician. 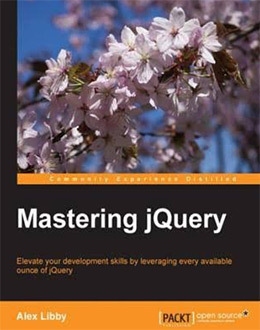 When you’re ready to build fully-fledged jQuery applications then you’ll want a book like Mastering jQuery. Over 376 pages you’ll learn how to apply your jQuery knowledge to real projects like image upload apps and custom shopping carts. Some of the early chapters can feel basic focusing on event handlers and Ajax forms. But these topics do get much more complicated. It can take months for newer developers to fully grasp how event handlers work. I’m actually glad to see the easier content in the beginning since it blends nicely with later lessons covering the Page Visibility API and even a workflow for building Node+jQuery webapps. If you’re looking for practical ideas for projects to build on jQuery then this book will prove to be a valuable resource. I debated whether to add this book since it covers so much over the entire jQuery library. But the authors both have years of experience and they approach teaching from a unique cookbook-style perspective, so I really feel it’s a valuable asset to this list. jQuery, jQuery UI, and jQuery Mobile offers an introduction to all the major jQuery libraries. The book totals 400 pages and it’s filled with practical examples of webapps in action. You’ll learn about the DOM and custom Ajax solutions, plus mixing the jQuery UI & mobile libraries into your workflow. My biggest complaint is how quickly this book moves through content. Yes it’s exhaustive and it’s certainly the perfect guide for anyone that wants to learn all three libraries for building real-world projects. But if you just want to learn jQuery in detail then you should stick with one of the other introductory books in this list. You can build so much on jQuery and it’s easy to end up distracted from all the features. This is also true of PHP development which is rampant with hacky solutions that could be improved through better design patterns. The book jQuery Design Patterns teaches common workflows and best practices for constructing webapps on the jQuery library. You’ll learn how to properly organize your code, how to optimize for performance, and how to abstract your code for plugins or API calls. You’ll even get into jQuery deferred, promise, and custom callback loops for multi-tiered functions. This is the single best book you can get to move from “good” to “great” with jQuery. If you apply these design patterns to real projects they’ll eventually become second nature. 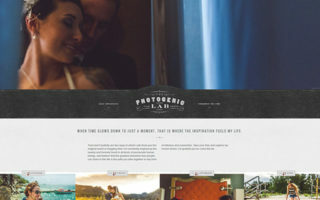 Your web projects will move fast and they’ll be real easy to edit in the future. 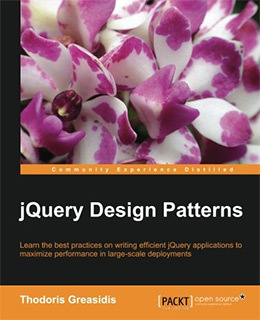 If you want a roadmap for learning I’d say to start with jQuery in Action and then pick up this design patterns book. Once you read through both of these and put the lessons into practice you’ll find yourself within the top 25-35% of jQuery developers. Even the best developers keep cookbooks handy for complex solutions and uncharted territory. 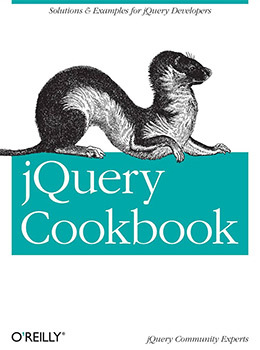 The jQuery Cookbook by Cody Lindley contains 480 pages jam-packed with code snippets, design patterns, and solutions to common application features. Many solutions are provided from other jQuery developers active in the community. So while Cody is credited as the author you’ll get solutions crowdsourced from some of the wisest jQuery developers in the world. Each recipe offers a code solution but it also aims to help you learn. By studying these recipes you’ll pick up best practices and syntax styles that are sure to improve your everyday workflow. And since you can get this book for pretty cheap I’d recommend it to any frontend developer serious about jQuery. The library has so much to offer and a cookbook simplifies it all down into practical & repeatable patterns that you can directly apply to real project work. One of jQuery’s sister libraries is jQuery UI. It’s another free open source project offering pre-made page elements and custom styles for dynamic inputs like sliders, dropdowns, and checkboxes. But you also get more complicated features like draggable elements, resizable widgets, and droppable areas for drag-and-drop uploads. 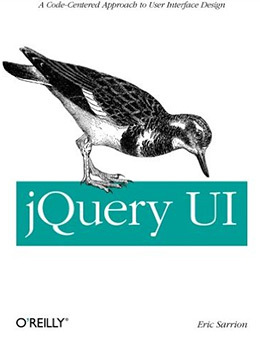 jQuery UI makes dynamic web development simpler. But it’s still a detailed library with a lot to learn. 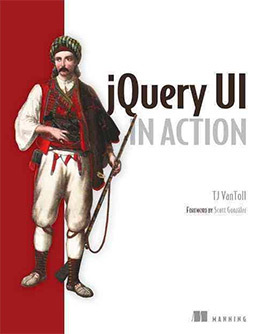 Your one-stop shop for learning jQuery UI development is jQuery UI in Action by T.J. VanToll. It has just under 400 pages full of exercises teaching all the major jQuery UI components from select menus to draggable interfaces. What I like about this book is the level of detail in each exercise. You start by studying the basics of jQuery UI from widgets to interactive components. From there VanToll guides you through exercises for custom animations, theming, and even building your own widgets from scratch. All of these “in action” books really live up to their name. You’ll work through lessons and each chapter pushes you a bit further along. By the end of this book you’ll know how to build custom widgets & themes from scratch including custom jQuery UI plugins. 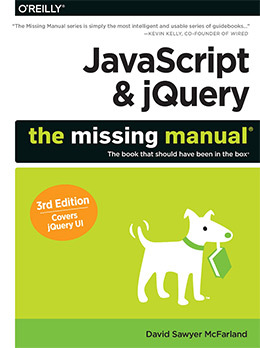 This book is perfect for anyone who already has jQuery experience but little-to-no jQuery UI experience. You can pick this up as a novice and by the end you’ll be able to build anything you can imagine. I also did a more thorough review of this book if you want to check that out to learn more. This book’s title has a version number that doesn’t match the current stable release, but the tips inside sure do. With the book jQuery UI 1.10 you’ll learn how to build crossover apps using jQuery and jQuery UI together. This isn’t simply a jQuery UI book. 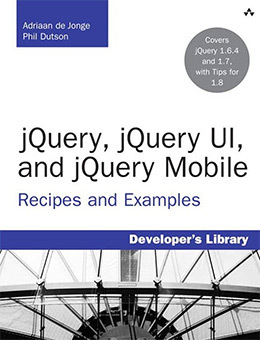 It’s really a full jQuery book covering the core library and the jQuery UI library with handy solutions for real-world scenarios. You’ll learn all the basics of jQuery UI components like tooltips and form elements. 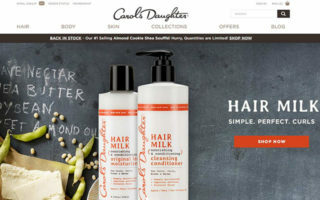 But you’ll also learn how to custom style those elements from scratch with CSS. This topic isn’t often covered in jQuery UI books and it’s a big piece of the pie for developers. Later chapters get into event handlers and programmatically checking for actions on individual UI elements. 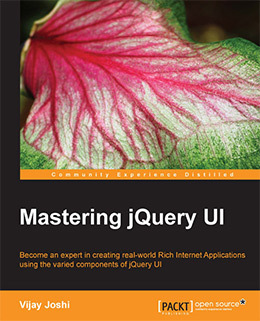 These lessons get detailed so this book is great for anyone who wants to take jQuery UI and make it their own. If you didn’t like the previous book for being a couple versions outdated then you probably won’t like jQuery UI Eric Sarrion. 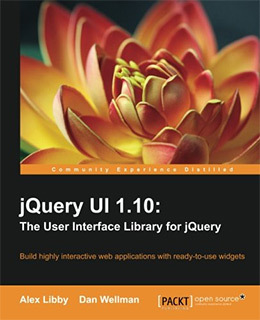 This book covers jQuery UI v1.8 with individual sections for all its dynamic elements. You’ll learn about the basics of jQuery UI and how to set it up from scratch. Then Eric goes into more detailed lessons covering each component. These are UI elements like tabs, accordions, modal dialog boxes, and calendar date pickers(among many others). These elements can save time and stress when building a rather complex web form. But you need to know all your options before you can just build something. That’s the best reason to get this book: to learn all the options available to you in jQuery UI. I’m assuming O’Reilly plans to release a newer edition at some point down the line. But in its current form this book is a nice introduction to the basics of jQuery UI without all the hoopla surrounding minor updates/features. Both jQuery and the UI library fit well in modern web projects. But if you’ve never used them before you might not know how they fit into real-world projects. With Mastering jQuery UI you’ll learn through examples by building a ton of really cool websites with features like a CAPTCHA code and a custom news reader. Later lessons get more complicated with a browser-based puzzle and custom Ajax apps using JSONP responses. 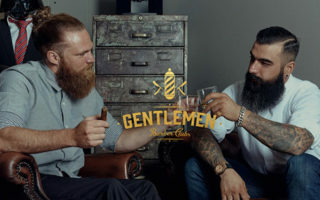 These lessons are very detailed but not impossible for newcomers. You just need to know typical jQuery syntax and how to apply basic jQuery UI elements onto a webpage. Anyone with minor experience using jQuery should be able to work through these examples comfortably. I highly recommend this book as a further resource for developers looking to push themselves beyond the basics. These exercises are demanding but they’ll teach you how to structure webapps with jQuery UI components in mind. 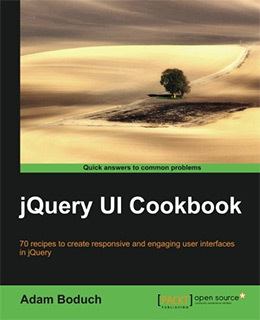 Lastly we have the jQuery UI Cookbook full of 70+ different recipes for building advanced web components. You’ll get templates for building custom widgets and plugins along with custom animation effects and form elements. Many recipes include jQuery scripts to check user events and unit testing for more complex projects. Plus Adam shares his advice for getting the most out of your code with optimization and reusability. This cookbook is valuable not just for the recipes, but also for the knowledge and coding practices you’ll pick up by working through the recipes. If you’ve ever tried building a custom mobile webapp you’ll know it’s a lot of work. The jQuery team made a small library to help with this process called jQuery Mobile. It runs on the jQuery core but it comes with default components made for smaller screens. jQuery Mobile apps resize properly based on the device and they’re built to handle touchscreen interactions like taps and swipes. If you’re not sure how to get moving with this library then take a peek at some of the books below. If you’ve never built a mobile webapp in your life then you have a lot to learn. Everything has to be structured for mobile screens including the size of page elements and the interactive features. 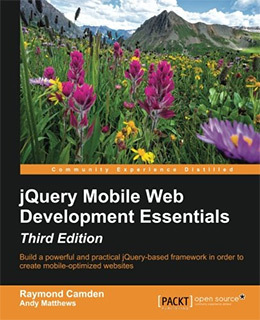 jQuery Mobile Web Development Essentials teaches everything you need to know about jQuery Mobile in just 266 pages. 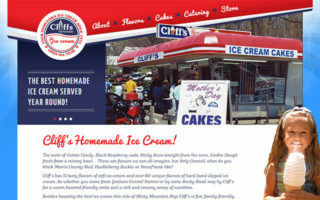 You start with basic HTML optimization and then learn how to add jQuery Mobile into your site’s template. Since pages load dynamically you’ll need to learn how routing works and how to structure content so that it feels like one application. jQuery Mobile handles most of these features, but you’ll still need to know how they work and how to apply them. 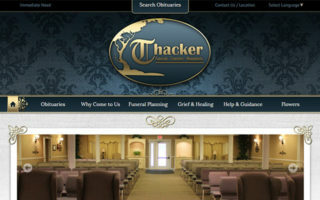 Later chapters get into custom theming with jQuery Mobile offering CSS hacks and pre-built solutions for theme design. Overall this is a pretty nice book for beginners and it covers all the primary features in great detail. Here’s another competent beginner’s guide which I think might be the best choice in this whole list. 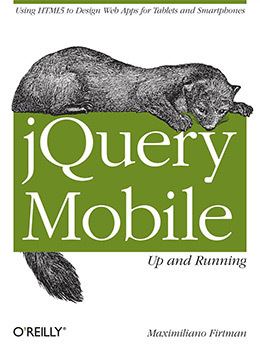 jQuery Mobile: Up and Running by Maximiliano Firtman teaches you how to get started fast with jQuery Mobile. He doesn’t waste any time on basic jQuery code so you’ll already need to be familiar with the core library. Instead he dives right into jQuery Mobile setup, components, and user interactions. Max has years of experience building on the mobile web so he’s the perfect instructor to learn from. Through real practice lessons you’ll learn the jQuery Mobile syntax along with design patterns and best practices. Mobile webapps need to be fast so these optimization tips will prove to be crucial in your project work. It certainly is possible for someone to learn jQuery and jQuery Mobile at the same time. It won’t be easy, but with a book like this you can move through the lessons and look up your questions online as you bump into problems or confusing topics. 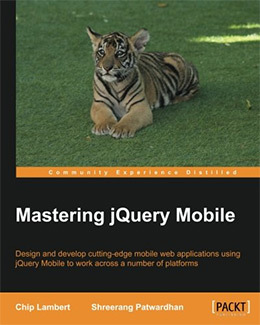 When you’re beyond the novice phase and ready to build real mobile webapps then consider grabbing a copy of the book Creating Mobile Apps with jQuery Mobile. These lessons target more experienced developers who want to build production webapps with the jQuery Mobile library. You’ll learn how to embed HTML5 videos, how to pull data from external APIs, and even how to access geolocation data with jQuery Mobile. These features are all supported in the library but they’re not easy to learn. More complex chapters teach you how to build CMS-powered jQuery Mobile sites using WordPress and Drupal. You’ll also learn how to embed plugins to add custom functionality without writing any extra code. This book is surprisingly advanced but what you’ll learn is beyond phenomenal. I highly recommend this book for developers that want to build high-level jQuery Mobile apps from scratch. All of these exercises are practical and surprisingly detailed. 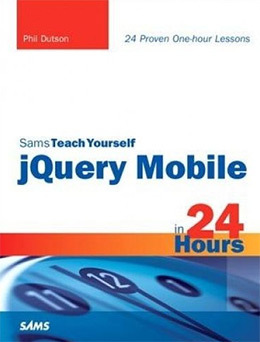 You’ll walk away from this book with professional knowledge of jQuery Mobile regardless of your current skillset. I adore the simplicity of the Sams Teach Yourself series and how much you can learn from their lessons. With jQuery Mobile in 24 Hours you’ll learn about the basic setup and page components like menus, toolbars, and tabbed widgets. This book is pretty massive totaling about 500 pages. Most chapters include detailed exercises but they also cover theory and personal anecdotes. Early chapters talk about the basic structure of a mobile webapp from the very beginning. This is perfect for brand new developers who have no idea what a webapp is or how it functions. Then in later chapters you’ll learn about unit testing, QR codes, and optimization by minifying your files for the web. Overall this is a really great book for complete beginners. The teaching style is slow yet systematic so it’s easy to follow along even with very little jQuery knowledge. Going beyond the basics can be fun and challenging. 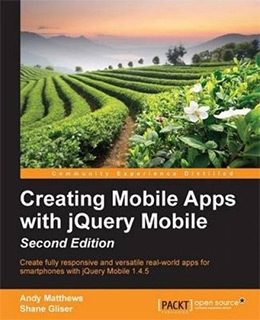 This book will challenge your existing workflow in jQuery Mobile by adding some 3rd party tools and free jQuery plugins. With Mastering jQuery Mobile you’ll tackle more complex topics like page swipe animations and custom page transitions. You’ll also build on top of a PHP backend while toying with other JS libraries like Node.js and Backbone.js. Advanced chapters introduce Apache Cordova which can help you publish real native applications built on the jQuery Mobile library. This lets you publish your apps to the app stores without writing any Java or Swift code. Bottom line this book is dense and technical. 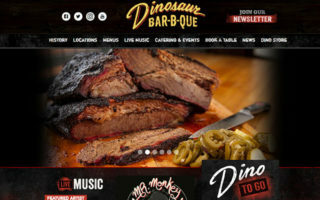 You need prior experience building on jQuery Mobile to actually learn anything from these lessons. But if you’re ready for a challenge and want to build professional webapps with jQM then this book is all you need. I know this is a huge list and there are tons of options to choose from. But whether you’re a complete beginner or a fairly experienced developer looking for new techniques I guarantee there’s at least one book here that can help you. Take a look over the list again looking for titles that catch your eye or topics that fit with your goals. Practice is the best way to learn and grow as a developer. As long as you put in the work you can easily master all of these jQuery libraries.